A simple suggestion by my mom, a few years back, –“Go and give it a try, don’t always depend on your instincts about your preparation. Who knows, you may be more deserving than you think” – changed the course of my life. A few years back, I participated in a debate competition in college. Since I hadn’t prepared much till the last hour, I decided to not participate in the competition. Before the event, my mom called me to wish me luck, but she understood that something was wrong from my “hello maa.” I informed her about my reasons for not taking part. Of course, she was not happy and eventually, convinced me to participate in the competition with that same line “go and give it a try. Maybe you deserve more than you think”. So, I did take part and stood 4th amongst 18 prepared candidates, ready with their preparation sheets and other notes. I believed it was luck. Cut to 3 years, and I am waiting for my call letter from the company I was placed in during campus placements. It was already a few months since my graduation. By this time, I had started to wonder if I would ever be called for my job. So, I started my preparation for other jobs as well. It was a tough time. The constant poking from neighbours and relatives added to my depression. Their comments like, “He said he’s placed, and yet is at home for five months, I think he lied about his placement,”, “He sits all day and pretends to study for exams while lying that he got placed in engineering.” I had one job offer at that time, where I was not getting called and to top that, I had already failed 17 interviews for IT, CORE jobs and army, airforce tests as well. Things had become from bad to worse. I simply couldn’t sit at home waiting for some miracle to happen in the midst of constant poking. I decided to prepare for CAT. I left the place and gave my all while preparing for CAT. I had taken CAT last year as well but not with much preparation, and was able to score 83%ile. This time, I was aiming for 99+. I had put myself under high pressure which ended up bombing my CAT and made my depression worse. I knew I had prepared well, I was content with my preparation, but my D-day performance was one of my worst. When results came, I had scored less than my previous score. I couldn’t fathom what had happened. I was even more depressed. But XAT was left. One more test was left. One opportunity was left. I applied for it but the depression took a toll and I ended up wasting 2 weeks out the 2 weeks time I had left with for the preparation. Now again, I felt I had wasted a lot of time and a week of preparation is nothing for XAT. But again mom called, this time one week left for XAT. I informed her about my state. I told her that since XAT would be a failure too and I couldn’t handle anymore failure; so, I would not be sitting for the test. She used that same magical line again. She talked me into not feeling sorry for myself and encouraged me to give my best shot at XAT. I prepared for what was left of time till XAT. My preparation for one week straight gave me the results of 96.3%ile in XAT. I wasn’t expecting a call from XLRI, but they did call me. I went through the whole selection process like a worthy candidate. Although XLRI didn’t convert, it had given me encouragement. It had given me a taste of success which I had forgotten. It had given me the motivation to try CAT AGAIN. It had given me the WILL to fight AGAIN. This is where I learned a major lesson in life: Never Give Up. In the year, I was able to score a job with Deloitte. This didn’t deter me from preparing for CAT. Even after having intense pressure from office as the code was going into production just the week before CAT, I knew this time that I need to give it a genuine shot. I again took a week off and put the final nail in the coffin. I did my preparation religiously, without being tense for the lack of time. Even after CAT results which weren’t great, I kept preparing for GDs and PIs in case I get even a single shortlist. Eventually, I just got 2 shortlists NITIE and new IIMs. The preparation was surely tough, 10-12 hours office on weekdays with 3-4 hours of total journey time to and fro from office and 9 hours of coaching in weekends, no offs for two straight months. Eventually, I did make it and landed at NITIE, Mecca of operations, with even more self-confidence and never give up attitude. This attitude again helped me at NITIE. Soon after entering NITIE, I was mesmerized by the fact that a beautiful pond was just 20 meters away from the hostel and a 24*7 access to it. 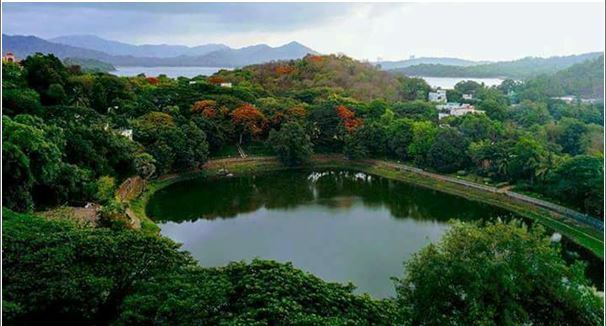 It is the most beautiful campus in entire Mumbai due to the 50 years old trees. Though the 96 stairs to the main building were a pain in the start, they’ve become a habit now. However, the campus wasn’t the only thing that fascinated me. The students were also one who fascinated me. Being the only college in India to have students coming in from CAT as well as GATE fascinated to a point that how can a place be such an amalgamation of so many talented people. My friends include people who have worked for top technology firms, to my roommate who was an assistant manager in a bank, to people who have been working in maharatna PSUs due to their jaw-dropping ranks in GATE. For some time, I had an inferiority complex but then again, the ‘Never Give Up’ attitude helped me to work hard, bring myself up to the level of these people and then learn from these people ask well. I learned a life lesson here – Your efforts don’t go in vain. Even if you think you haven’t prepared enough for a test, it’s not just the week’s efforts that make it happen or not, but your accumulated hard work which has trained you to perform well and which makes it happen. So, always be prepared. Hard work is tough and is nothing without suitable opportunity, but whenever opportunity knocks, you need to be ready to make the most of it. PS: In the debate story, it wasn’t luck, it was my accumulated hard work which had somehow trained me to be good at debates. You delivered at the time when i needed it the most. “Hang in there and keep fighting”.